The use of roses for beauty and skin care dates back decades, to the ancient Greeks and Romans who would include rose petals in their bath water. The petals not only perfumed the water, making the experience that much more luxurious, but they also carried several benefits in relation to the condition of their skin! Since this time, the benefits of rose petals, rose water and rose oil have become much more common, with rose related products popping up on drug store shelves the world over. 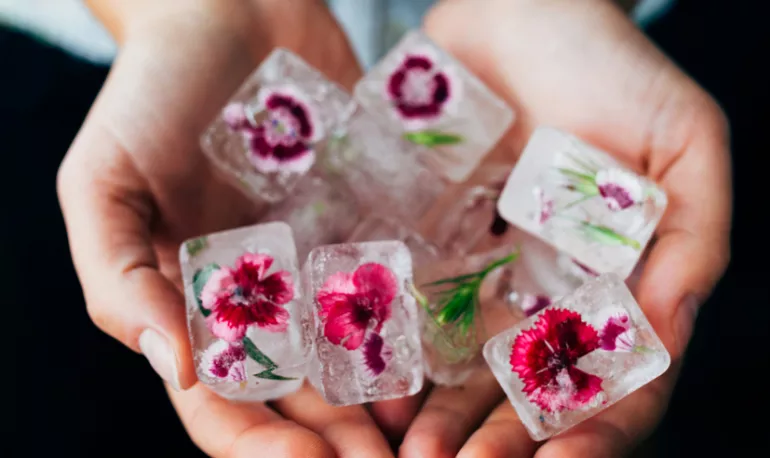 A popular skin care routine in Iceland involves freezing various herbs and flowers into ice cubes. They apply the ice cubes directly to their face, running them along their faces and necks as they slowly melt. This has been found to help reduce inflammation, close pores and brighten skin. The herbs and flowers vary, each with their own unique medicinal properties. Anna Rosa Robertsdottir, a well-known herbalist wrote ‘Icelandic Herbs and Their Medicinal Uses,’ listing 90 different native herbs and their medicinal properties. Mix all of the listed ingredients in a bowl. Gently pour the mixture into the ice cube mold. Top each ice cube with your chosen herb or flower, then place the tray into the freezer. Allow the tray to sit until the ice cubes are frozen solid. Taking a single ice cube, run it slowly along the face paying careful attention to the eyelids and the sides of the nose.